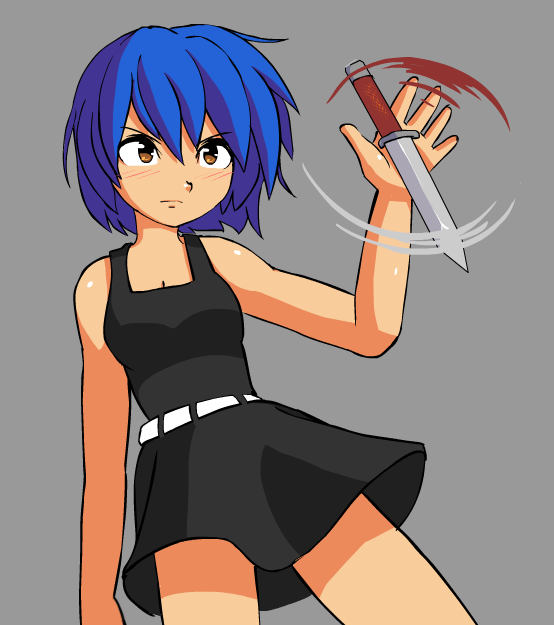 While I was messing around in flash today I did some quick fanart. Might do some other H-game characters at some point. 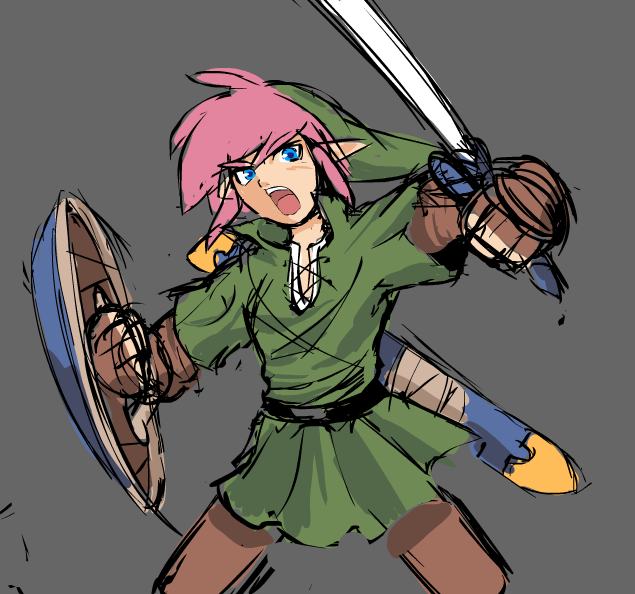 Didn't draw her with a gun because I'm terrible at drawing guns..
Also, just because pink haired link is awesome. A Link parody might be something nice to see in a future game. Maybe a girl version of him, with pink hair. It's the legend of princess. Konjak is a master of 2D platform games. check it out. I dunno if I'd call him a master of platform games. But he is a master of pixel art. Now I'm honestly curious as to who you think is a master of platform games. definitely not konjak. his games are pretty mediocre, though his artwork is good technically. Unfortunately, few game developers learn much about designing platformers before making them, and anybody who was good at it in the early days of video games either doesn't do it anymore or seems to have forgotten all the principles they themselves pioneered. Today, the only competent platformers are puzzle platformers, which is a different kind of design entirely, and not really a fair comparison. The only good modern platformer I've played recently is Rayman Origin's/Legend's, but those games aren't perfect, either. So in other words, there is no master of platformers that I know of. There may be some indie game somewhere, but I've yet to see it. Any time I see "retro" used as a buzz-word for modern platformers with bad pixel art, I think I die a little inside. Hmmm... how about Guacamele. I have a ton of respect for that game as a platformer. Also, anon... what? Konjak's games are mediocre? Sure they may be short but they're definitely not mediocre. I dunno.. to me Guacamelee felt more like a beat'em up with platforming sections than a straight up platformer. Like puzzle platformers, it sort of occupies a different space than something like say, castlevania or megaman, similar to the way Contra is technically a platformer, but plays like a shooter. That said, Guacamelee it's certainly more of a platformer than something like Muramasa. What about Super Meat Boy or Spelunky? As for Konjak, I wouldn't call his games mediocre but there's definitely something missing, I can't say what it is though. He's an amazing artist and he puts some interesting mechanics into his games but there's something missing that keeps them from being truly great. Spelunky is procedurally generated, so you're more or less taking traditional "level" design out of the equation. It's more about designing a system that encourages emergent game play, which is a different kind of mastery altogether from creating a single memorable level. Meat boy I would categorize as a "challenge platformer". Most games where you're re-spawning constantly with little to no consequence are of a similar genre. It's not really the same design philosophy as a traditional platformer, and many of the design principles don't really translate. So how would you define a platformer in the strictest sense? Anything where platforming is a primary or secondary challenge in the gamplay. For instance there are puzzle games with platforming, yet if the platforming isn't challenging enough to actually be a factor, I wouldn't consider it to be a platformer. However, when I say "platformer", I'm generally referring to "traditional" platformers. Something like Meat boy has completely different design principles behind it than something like Megaman, or Super Metroid. Super Meatboy is what I would call a "modern" platformer (Not because of it's age, but because it's design elements have only really emerged and become a trend recently). If you're asking what I define as a traditional platformer in the strictest sense, I couldn't really give you a short answer. However I will say that a lot of modern platformers are based around idea that the person playing isn't going to be playing for long. It's mostly a bi-product of early flash games that were usually quick to pick up and play. This is why games like Angry Birds are fun for a couple rounds, but it would get repetitive if you played it for 3 hours. Longer sessions benefit from deeper gameplay, and a lot of modern game's aren't really optimized or meant for it. Ugh, 'Girls with Guns' is so overused >_______>. But I like the Link! Then you haven't seen it done well. Mikuru Nazume... so well done. Funny how much better you're able to draw Misa compared to Nekonomeme himself. LAB was a fun little game, though. Huh. I'm surprised that you think that. Personally, I've only seen three or four fan drawings of Kuro, and with one exception, they're relatively simple ones. Maybe I'm searching the wrong sites... Hm. Link to the past version? I hope its still a metroidvania game, your good at that genre, doesn't matter if the game is like super metroid element or SotN RPG element, as long as the game is enjoyable.